The virtual TIMELINE includes almost 150 events relating to the tragedy and its aftermath. As part of the commemoration of the 25th anniversary of the bombing of Pan Am Flight 103, the Pan Am Flight 103/Lockerbie Air Disaster Archives has created a virtual timeline that includes almost 150 events relating to the tragedy and its aftermath. Pan Am Flight 103 was destroyed by a terrorist bomb on Dec. 21, 1988. The Boeing 747, named Clipper Maid of the Seas, was en route from London’s Heathrow Airport to New York’s JFK when it exploded over the small town of Lockerbie, Scotland. All 259 passengers on board and 11 people on the ground were killed. Thirty-five of the victims were students studying abroad through Syracuse University. From the search and rescue efforts to the current inquest in Libya, all pertinent dates related to the bombing are presented along with a relevant document, image or video found in the archives collection. 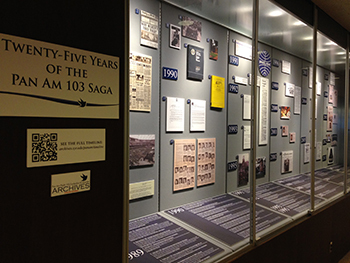 An exhibition, titled “Twenty-Five Years of the Pan Am 103 Saga,” has also been installed on the sixth floor of Bird Library and highlights the most crucial events found in the larger online TIMELINE. The related materials may be viewed alongside a brief footnote explaining the importance of that event in the history of Pan Am 103. The exhibition will run through the end of the year. To see the full TIMELINE, visit http://archives.syr.edu/panam/timeline.html.